While all of Egypt holds archaeological riches of immeasurable importance, the priceless evidence of one the longest-lasting and most outstanding civilizations in human history, the archaeological district formed by Luxor and the Valley of the Kings is still today a historical and artistic treasure chest awaiting the modern visitor. This book takes the reader on a complete tour of these magnificent temples and tombs, with photographs, plans, and concise yet information-laden texts. 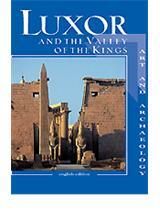 Fully illustrated with more than 300 color photographs and maps and plans, Luxor and the Valley of the Kings covers the archaeological riches of ancient Thebes in depth, with comprehensive chapters on Luxor’s splendid Karnak and Luxor temples, as well as the treasures of ancient Thebes preserved in the Luxor Museum. The ‘land of the dead,’ stretching out on the Theban west bank, is represented by the mortuary temples of the pharaohs, including those of Hatshepsut, Amenhotep III, Seti I, Ramesses II, and Ramesses III. In addition, numerous tombs in the Valley of the Kings and the Valley of the Queens are shown in detail, as well as the colorful tombs at Deir al-Medina and in the private necropolises. Through a review of the most important sites, the splendid works of art contained in the tombs, and the most recent archaeological discoveries, this book reconstructs historical events buried for centuries under the sand and offers the reader a fabulous voyage through ancient Egypt. ALESSANDRO BONGIOANNI received his degree in Egyptology from the University of Turin, writing his thesis on the religion of the Amarna era. He has published numerous articles and is the co-editor of The Illustrated Guide to the Egyptian Museum (AUC Press, 2001).